Dive Journal: It's been a long layoff from diving! Too long! Our daughter is living and working in Bangkok for the past 6 months, and we all agree that it's the perfect opportunity to travel to Thailand and spend some precious time with her. Our travels take us first to Bangkok, a truly fascinating and bustling place. The food culture there astounds us - it's our favorite part. Our month of travel in Thailand takes us to Chiang Mai, Chiang Dao, Phuket, Khao Sok National Park, the Chiao Lan Lake, and Koh Lanta. Details of the entire trip are included in a daily blog we kept online at torksinthailand.blogspot.com. Details of our boarding the Queen Scuba on March 10, 2010 were captured by Janel at torksinthailand.blogspot.com/2010/03/maritimes-are-good-times.html. 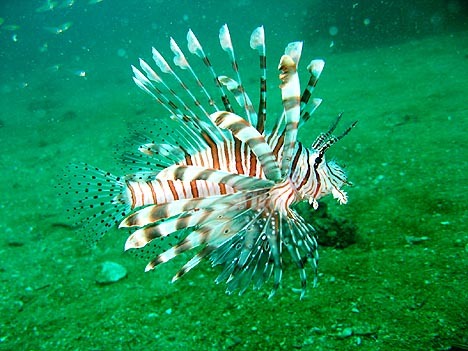 Details of this dive day, March 11, 2010, were captured by Linda at torksinthailand.blogspot.com/2010/03/dive-dive-dive.html. 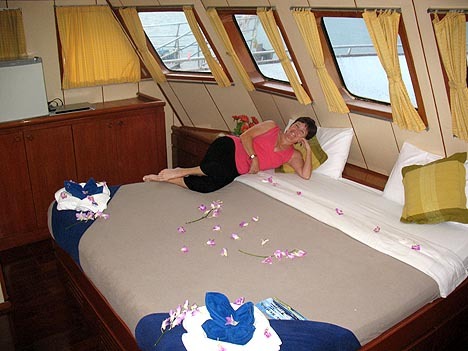 From Phuket, we catch a ride north to the port of Khao Lak, and board the liveaboard Queen Scuba. She is a very fine looking boat, 3 decks, with a beautifully designed diving platform astern. To match her good looks, the boat is staffed with an outstanding group of diving pros and support staff. Our first dive occurs the next morning at Anita's Reef, on the western side of Koh Haa (Similan Island #5), chosen for its relative shallowness, an opportunity for the diving staff to check everyone out. But we're at the Similan Islands. At once, this dive site astounds us with a sand bottom full of sandy partner gobies and their brethren shrimp. I'd seen this partnership years ago at a Kosrae dive, but never so many in one place. The site consists of a sloping bottom with a collection of reef-covered boulders. Very early in the dive I spy my first common lionfish - sweet! I'd seen one off Yap years ago, but they're always a treat. Shortly after that, our diving guide Kim points out an ocelated dwarf lionfish, a relative rarity. 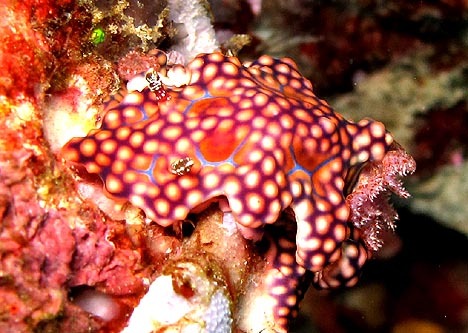 Kim then points out a nudibranch called a miamira in the process of laying eggs - wicked cool. We soon learn that Kim has an expertly keen eye for finding critters, especially small ones. My poor eyesight isn't what it used to be, and I can't quite see some of the small stuff Kim finds. Not a problem, however. This dive site is awash in schools of fish. They seemingly appear from all angles, cascading across our field of view. This is my favorite element of this dive. Kim finds many more critters for us, and helps us identify them after the dive, with most listed below. To her credit, Linda spots the first of many varicose wart slugs, as well as a jewel fairy basslet. Examining the reef at one spot, I feel nipping at my ears and then my temples. I back away to see a blue and black cleaner wrasse point-blank in my face! Linda has been fighting a cold sore on her lip, and when she surfaces she's in some pain and her lip is all bloody from these wrasses attacking it. Man! The Queen Scuba requests a conservative 5 minute safety stop, and we hover in midwater to complete it. I'm diving with a cold, so I'm pumped up on antihistamines, decongestants, Tylenol, and antibiotics. My ears feel 'foamy' but seem to clear OK. Likewise, Janel is just finishing up a cold and has trouble clearing her ears on ascent. I'm impressed how calm she is about it, though, and she makes a very slow ascent to deal with it. Water temps are great, maybe 82 to 84°F, with only a mild current here.